As a reader on our site, you should be very familiar with Crucial and their highly regarded consumer SSDs. Most recently recently, they announced their newest drive the MX100. In our review, we found it to be a great value SSD as it offers its owners many enterprise grade features at a very competitive price, due in part to Micron’s latest 16nm MLC NAND. On the other hand, Micron is typically known for their joint NAND flash venture with Intel, called IMFT. They are also known for their OEM and enterprise flash memory products. Their client level drives are typically developed with the Crucial consumer SSDs under the same team. This time around, Micron decided to split up development for their next generation client SSD and Crucial’s latest consumer drive, the MX100. Today, Micron we are reporting on their latest client level drive, the M600. The Micron M600 series doesn’t just consist of 2.5″ 7mm drives as the Crucial MX100 series, the family expands into M.2 and mSATA variants as well. This allows Micron to supply for the ever-growing ultrathin PC tablet market as well as the corporate notebook and workstation demands. What has come from this strategic move is greater endurance, improved performance, and an expanded capacity and form factor portfolio. The M600 has much better endurance over previous client drives. Typically, Micron’s drives were rated for up to 72TB of writes. This next generation is rated for up to 5 times greater endurance, even after the transition to 16nm 128Gbit NAND. For 128GB, it is rated for 100TB total bytes written and the 256GB drive is rated for 200TB TBW. The 512GB is rated for 300TB TBW and finally, the 1TB drive is rated for up to 400TB TBW. A new feature added to the M600 is dynamic write acceleration, the key word being dynamic. It allows for better performance, lower power consumption, and lower write amplification. Micron’s latest NAND technology can operate in SLC mode or MLC mode on the fly. There isn’t a set amount as with other SLC mode caching technologies. This allows for a dynamic pool of SLC-mode NAND which dramatically increases write speeds on smaller capacity drives, even up until they are 99% full. This feature is not enabled in the 512GB and 1TB 2.5″ models due to their design allowing full SATA 6Gb/s write saturation. However, it is enabled in all other capacities and form factors. Furthermore, Micron offers variants of this drive that are self-encrypting and non-self-encrypting. SED drives have AES 256-bit hardware encryption from the built-in controller encryption engine. It is TCG Opal 2.0 and IEEE1667 compliant to support the Windows eDrive standard. Micron has also worked closely with WinMagic and Wave to ensure the M600 is compatible with their encryption management software. Other features to aid in data integrity and lower power consumption include RAIN reliability technology, device sleep, data path protection, and adaptive thermal monitoring. Performance wise, the Micron M600 offers read speeds up to 560MB/s and write speeds of up to 510MB/s for all models save for the 128GB capacities, which are rated for up to 400MB/s write speeds. Random performance follows a similar trend. The 256GB, 512GB, and 1TB drives are rated for 100,000 IOPS read and 88,000 IOPS write, while the 128GB capacities are rated for 90,000 IOPS read and 88,000 IOPS write. As for availability the M600 series SSDs are in production and sold directly to OEMs, system builders and businesses through Micron’s distribution network. 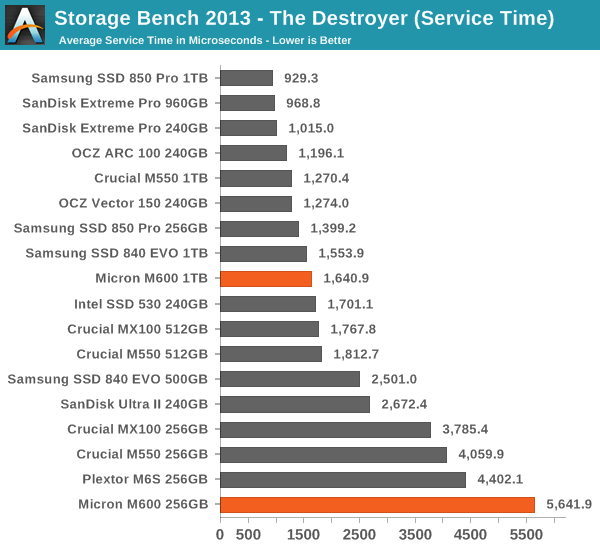 And Micron is following their typical trend of offering a three year warranty for this client SSD family. Reviewer packaging for the M600 is simple and yet, a bit elaborate. The drive is enclosed in a white box that uses a paper sheet and a skirt to keep it closed. Once the skirt is removed the box unfolds to the SSD within. The actual information provided with the drive is lacking, the sheet included just states some basic benefits of the SSD. The front and back of the M600 are also very plain and simple. The case is made of a black brushed aluminum. Instead of the typical case design where manufacturers use screws to keep the sides of the casing closed, Micron decided to go with a snap close design, similar to that used on mobile phones. This makes it impossible to open without leaving marks. Inside there is a thermal pad attached to the aluminum casing that rests against the back of the controller on the PCB and is used to help dissipate heat. Below are the images of the 256GB PCB front and back. As you can see, the 256GB drive only uses eight NAND packages and a single DRAM chip. Directly above the DRAM chip is the power loss protection circuit, which seems a little small compared to what we have seen from the Crucial MX100. The back is almost completely bare. Next up is the 1TB PCB. Immediately we can see there is a difference in design. The 1TB is built with 16 NAND packages as well as 2 DRAM chips. The power protection circuit is also much more apparent above the DRAM chip on the front. Below, we have a shot of the drive’s Marvell 8 channel 88SS9189-BLD2 controller. This is the same controller that is used in the Crucial MX100. This controller allows for enhanced DevSleep support over Marvell’s older 88SS9187 controller. DevSleep’s power consumption for drives 512GB in capacity and less is 2mW and for the 1TB model, 3mW. Furthermore, it allows for full hardware encryption support as well as enhanced data protection features and adaptive thermal monitoring to ensure your data’s integrity and safety. The following image is a close up of the power protection circuit for the 1TB model. By using the Micron FBGA Decoder, we can identify the NAND product number for the 256GB drive as being MT29F256G08CECCBH6-10:C and MT29F512G08CKCCBH7-10:C for the 1TB model. The NAND is their 16nm MLC NAND flash memory with each module being 32GB in capacity for the 256GB drive and 64GB for the 1TB drive. The usable storage space is only 238GB and 953GB respectively. Furthermore, we can identify the DRAM memory as having the product number MT42L256M16D1GU-18 WT:A. The DRAM used on drives are 256MB chips of LPDDR2 that run at 533MHz. Yeah. It would be awsome, if they could just enable DWA thru firmware update for MX100. Wow, I really thought I could use the m600 as laptop ssd, but with such bad and much worse than advertised idle power consumption I’ll think twice before buying it. Eagerly waiting for the mSATA review, but because the 2.5″ results are already that bad, I’ll most likely wait for an Samsung 850 EVO mSATA which will probably be more alike to the 840 evo mSATA 210mW active idle. I’m sorry, I had not enabled hipm and dipm support for the drives when I tested the idle power draw. I have gone back and enabled it and new, much better idle results have been found. The 256GB model sits around 55 milliwatts idle and the 1TB sits around 45 milliwatts idle. The new results have been added to the review. Hey Les. Anandtech also reviews the M600. But service time of the M600 is the worst of all SSD drives. Despite DWA? I make it a habit not to read through others reviews, but thanks and… I did take a read. Thanks. The beauty of independant reports is that one gets to make the best decision through several differing opinions. Sorry to go off here but when are we going to see 1TB PCIe m.2 solutions at 4x? Is 1TB possible?